On Friday October 24, 2014, His Holiness Patriarch Mor Ignatius Aphrem II visited Sadad to celebrate the Divine Liturgy (Holy Qurobo) on the occasion of the one year remembrance of the martyrs of Sadad. His Holiness was accompanied by His Eminence Mor Dionysius Jean Kawak, the Patriarchal Assistant. His Holiness was welcomed by His Eminence Mor Selwanos Boutros Al-Nehmeh, Archbishop of Homs, Hama and Environs. 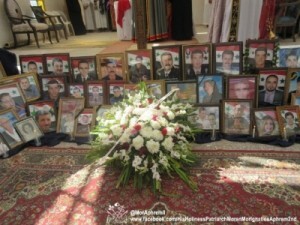 He was greeted by the scouts and presented a wreath of flowers to the memorial pictures of the martyrs of Sadad. His Holiness Patriarch Aphrem II then celebrated the Holy Qurobo assisted by the archbishops. 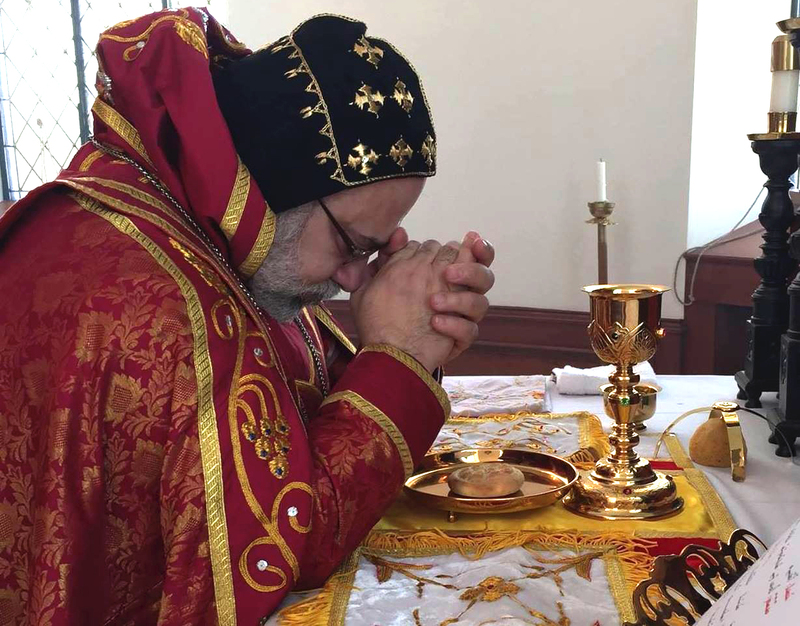 In his sermon, His Holiness assured the faithful of Sadad that the Syriac people around the world are united with them in prayer and share their pain and suffering. He said: “we cannot forget the great sacrifice that these 79 heroes have offered, they gave their lives in defense of their faith, society, land and country; we pray for them today remembering their courage and integrity”. He continued: “this dear town Sadad had to pay a high price for its honest love for Christ first and especially for our beloved country Syria too”. 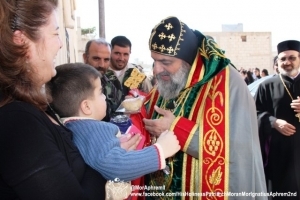 He pointed out that the church is praying for Sadad and all of Syria, adding that the “sun of freedom, security and peace is shining in the hearts of the faithful citizens”. 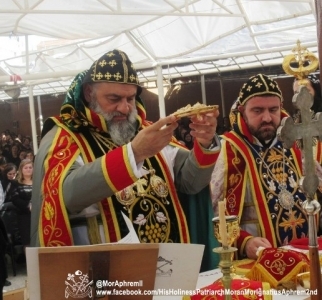 Patriarch Aphrem II said also that the crisis is aggravated with the emergence of moral principles that are strange to the Syrian people, and these principles are manipulating the mentality of some Syrian citizens causing them to be away from their compatriots and neighbors which causes “a deep wound in the hearts of the Syrian citizens that cannot be healed except through a great faith in God, authentic love for the country and the neighbor”. 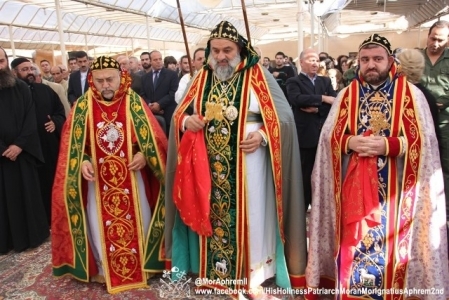 Patriarch Aphrem II spoke also of the Syriac genocide “Sayfo” which took place about one hundred years ago with more than half a million Syriac speaking martyrs who were killed without guilt and slaughtered for believing in Christ. He said that these 79 martyrs from Sadad join the martyrs of Sayfo which confirms that our attachment to Christ and to our country is still strong and solid. On the other hand, His Holiness greeted the martyrs of the Syrian Arab Army, the national defense and the Nationalist Party who are united in defending Syria and are sacrificing their blood “which was mixed with the bloods of the martyrs of Sadad. This is evidence of their great love for their country. He added that “we refuse all acts of disrespect for the Syrian citizen, Christian or Muslim” and he encouraged people to remain in their country and to refuse immigration. He added that Syria is the guarantee for the preservation of the dignity of all of its citizens. At the end of the Holy Qurobo, His Holiness presented his condolences to the families and relatives of the martyrs. « Is There A Place for Jesus in Your Home?